What is a Stratum 1 Time Server ? You are here: Home / NTP / What is a Stratum 1 Time Server ? A Stratum 1 Time Server is a network appliance that receives precise time from a hardware reference clock to provide a time resource to client computers. Network Time Protocol (NTP) implements a hierarchical system of time references. The stratum, or hierarchy level, represents the distance of a time server from the source reference clock. At the highest level, Stratum 0 reference clocks are hardware clocks. These include Global Navigation Satellite Systems (GNSS) and national time and frequency radio broadcasts. NTP implements a hierarchical system of time references. At the highest level, hardware reference clocks are referred to as stratum 0. 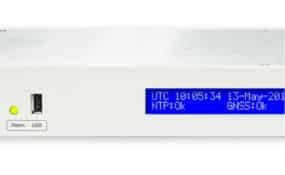 A stratum 1 NTP server has a direct connection to a hardware (Stratum 0) clock and is a primary network time server. Lower stratum servers reference a server in the stratum above. Essentially, stratum indicates the distance of a time server from the source reference clock. High precision time keeping devices, such as Global Navigation Satellite Systems (GNSS) and national radio time and frequency broadcasts (MSF, DCF, WWVB), are referred to as Stratum 0 Reference Clocks. These clocks are very precisely synchronized to national time and frequency atomic time standards. They are some of the most accurate time sources available. There are number of Global Navigation Satellite Systems (GNSS). Most well known is GPS which is owned by the US government and operated by the US Air Force. The GPS system provides global coverage with a constellation of 33 orbiting satellites. GLONASS is the Russian equivalent to the GPS system. It also provides global coverage with a system of 26 satellites. The European Union (EU) has launched a civilian GNSS system, Galileo. With 30 satellites, it also provides global coverage and promises even greater precision. In addition to GNSS reference clocks, there are also a number of national time and frequency radio broadcasts that provide precision timing. The most well-known being WWVB (USA), DCF-77 (Germany) and MSF-60 (UK). The radio broadcasts have a finite range and can only generally be received within national boundaries. They also lack the accuracy of GNSS based time sources. Stratum 0 reference clocks are not directly connected to a network. They only provide timing information and signals to a hardware device. Stratum 1 time servers provide the link between hardware reference clocks and a network. Network computer appliances that synchronize time with directly connected hardware reference clocks are known as Stratum 1 time servers. By using GNSS timing receivers or radio time code receivers, they synchronize their system time to within a few microseconds of the correct time. Stratum 1 time sources synchronize lower stratum devices over a network path. Lower stratum servers are network time clients, they synchronize over a network path. A server synchronized to a stratum N server automatically becomes stratum N+1. For example, stratum 2 servers synchronize stratum 3 servers, which in turn synchronize stratum 4 servers and so on. Valid NTP stratum levels are in the range 1 to 15. Stratum 16 is used by NTP to indicate an unsynchronized device. These are devices that have lost contact with their server and can no longer obtain time. Stratum 1 devices become stratum 16 if they lose contact with their hardware reference clock. Some stratum 1 devices can extend operation by using high-stability oscillators. The oscillators maintain accurate time to provide extended holdover. Sanity checking, redundancy and reliability can be enhanced by network linking (peering) multiple time servers. Servers can only be peered with other time servers of the same stratum. TimeTools has a range of Stratum 1 NTP Appliances that utilize GPS and Multi-GNSS source reference clocks. Our local NTP servers are more accurate and more secure than Internet based devices. For more information, please contact TimeTools. What is the GPS Clock ? 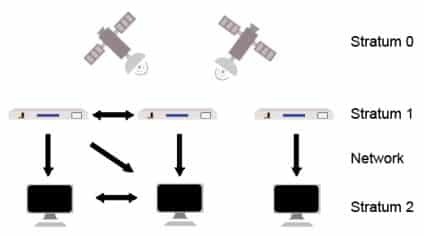 A Guide To GPS NTP Servers For Network Time Synchronization.